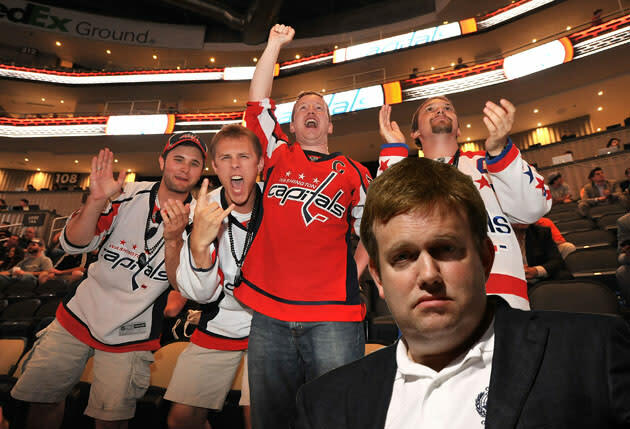 The greatest irony in the National Hockey League pulling together a focus group to test its messaging in the lockout: That hiring GOP toad Frank Luntz to handle said focus group probably further tarnishes their image. Barry Petchesky of Deadspin on Monday published an inside look at an NHL focus group facilitated by Luntz Global, which previously brought the world such memorable messaging as "the death tax." 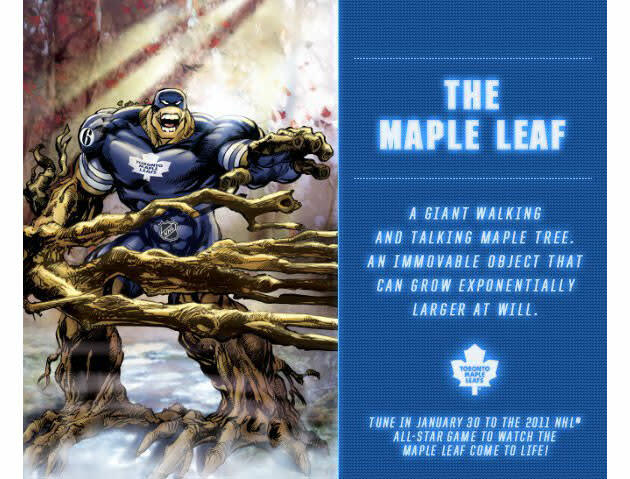 The NHL is losing the publicity war. While most fans categorize the negotiations as the rich vs. the richer, there's almost no sympathy for Bettman and the owners for promulgating their third lockout in 18 years. That's a perception they're desperate to change. While concessions will come at the bargaining table, the court of public opinion will dictate which side feels the most pressure to compromise. And, of course, when hockey does come back, the league doesn't want fans to feel so bitter that they stay away from the game. That's where Luntz's research fits in. • The NHL does market research fairly regularly, but we've learned this was the first lockout-specific focus group since the work stoppage began. What does that mean regarding the potential duration or intensification of the negotiations? I actually read it as a positive sign that we're going to get meaningful talks on the big issues soon, as the NHL is attempting to ascertain how public opinion could weight on the players depending on the timing or contents of a League offer. You don't go down this road, strategically, unless you believe the information will be vital. • Perhaps, next time, the Luntz Group can find a fighting photo that doesn't feature a dead player next time. Just sayin'. • While this shouldn't come as a surprise to anyone, the NHL is saying one thing and doing another on two issues that have been winners for the NHLPA. "Fan perception is important to us, but at the end of the day, we have to do an economic deal that's going to work for our clubs and our owners and our business and that's going to make the league healthy going forward." Judging by the questions here, fan perception goes hand-in-hand with whatever deal the League strikes — both in how it achieves its objectives and in the aftermath. Second, Bettman has said revenue sharing is "not an issue from our standpoint"; he claims it's because the NHL wants to simply expand the current system, but it's not hard to imagine it's also because Donald Fehr and the NHLPA have the high ground and the credentials here. 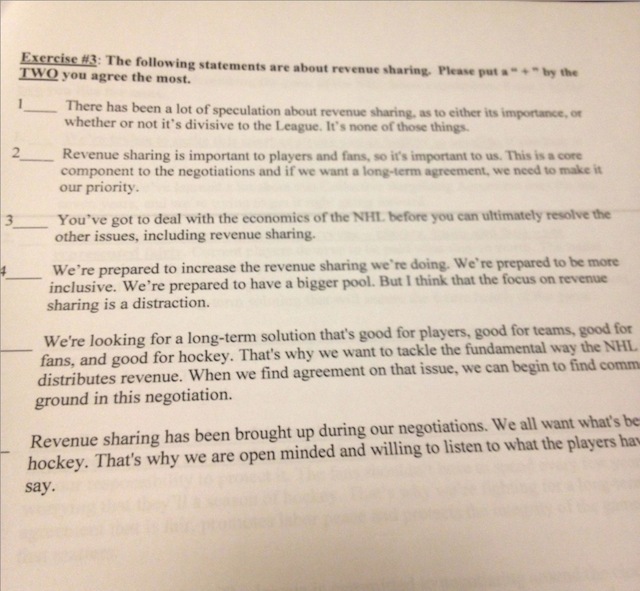 So for this complete non-issue, the NHL commissioned one of the world's biggest market research firms to ask a specific question about public sentiment on revenue sharing. OK then. • Not a single question about giving Bettman sunglasses and a surfboard to increase his demographic appeal? Really, Frank? 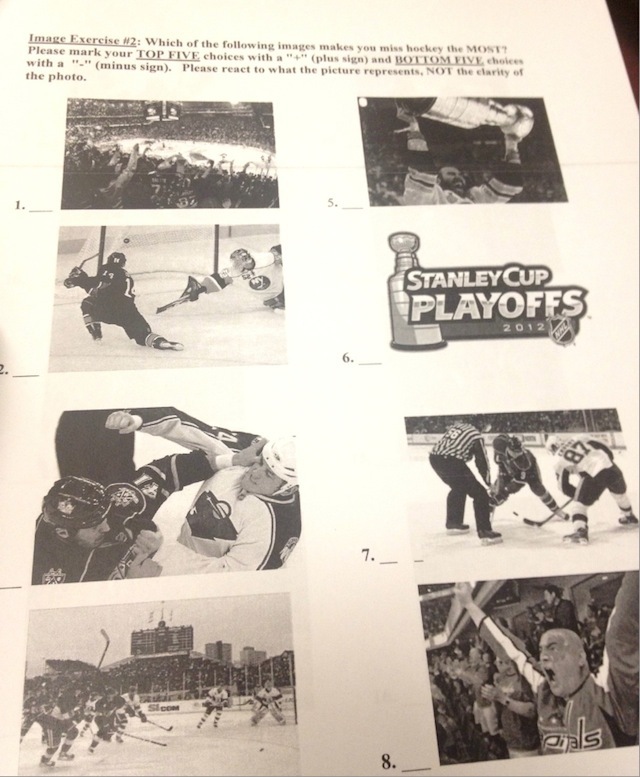 • Imagine our surprise when we discovered Puck Daddy's "What We Lost When The NHL Lost Opening Night" column — word for word for word for word — served as the basis for one of Luntz's exercises. We're sure that the Luntz group would never reproduce our work, in a for-profit endeavor, without consent. Then again, we were also sure that a highly regarded market research firm wouldn't collect money from a client for work that included reprinting an article published the day before the focus group was held. Surprises, they never cease. One participant gleaned from the content of these speeches the phrases and concepts the NHL might use going forward. The league is eager to portray individual players as not in step with the union, claiming that the majority of them don't believe or don't buy into the rhetoric used by Donald Fehr and NHLPA leaders, and that they just want to play hockey. "The players are not the enemy," the NHL may very well tell you. "The union is the problem." Divide and conquer, the formula from the 2005 lockout victory. The players and their agents have fruitlessly tried to make the same play with the owners — there's actually a reference in the Luntz materials to a "group of eight owners" shutting out the rest of their brethren in talks. But there's a better chance that the NHL succeeds with that gambit because you're dealing with players of different ages, salary levels and personal lives. It's one of the reasons Donald Fehr encourages the swift, mass exodus of players to Europe: Both as a show of solidarity, but also as a way to stay happy by playing hockey and making coin. Clearly, the NHL still feels like there's a chance to break the union by playing up a schism between the players and Fehr. But Fehr's worked for more than a year on solidifying that support. It's not going to be as easy as it was seven years ago. Again, go read the Deadspin thing. It's fascinating stuff. Anyway, we eagerly await the NHL's next focus group, which will focus on how to undo the damage from this focus group.